Tiglath Pileser III (ca. 745-727 B.C.) - By the middle of the 8th century B.C., the Assyrian Empire was in decline. 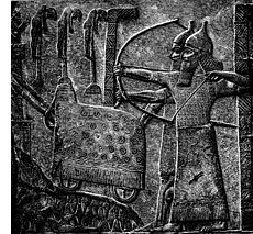 Its northern territories had fallen to he Kingdom of Urartu and several others had stopped paying their required tribute because they believed Assyria could no longer enforce payment. It was under these conditions that a rebellion broke out against the king, Ashur-nirari V. A governor from the city-state of Calah, named Pul, overthrew and murdered the king and ascended to the throne. He took the name Tiglath-Pileser III after the eleventh century king, Tiglath-Pileser I, who set Assyria on the path to empire. 3rd's reign can most accurately be characterized by conquest. He expanded Assyria in every direction, thanks to the creation of the first professional army on earth, and made it the largest empire in the world up to that time. His most famous campaign was his invasion of Judea in 734 B.C., which is recorded in the Bible. "In the days of Pekah king of Israel, Tiglath-Pileser king of Assyria came and captured Ijon, Abel-Beth-Maacah, Janoah, Kedesh and Hazor. He took Gilead and Galilee, all the land of Naphtali, and deported the people to Assyria." (II Kings 15:29). Deportation was a tool used by the king to prevent revolt. By removing the vanquished from their homeland, they would be less likely to rise up to take back their country. This campaign was the beginning of the end of the northern Kingdom of Israel, the "Ten Lost Tribes". While he conquered the hinterlands, the capital of Samaria survived. It was left to his son, Shalmaneser V to complete the operation. However, Shalmaneser died in 722 B.C. and Samaria fell in 721 at the hands of Shalmaneser's successor, Sargon II. Although Shalmaneser did the heavy lifting with a three year siege beginning in 725 and Sargon's work was little more than a mop-up operation.